Cell adhesion molecule 1 (CADM1) is a single-pass type I membrane protein belonging to the nectin family. CADM1 mediates homophilic cell-cell adhesion in a Ca2+-independent manner. CADM1 also mediates heterophilic cell-cell adhesion with CADM3 and PVRL3 in a Ca2+-independent manner. CADM1 acts as a tumor suppressor in non-small-cell lung cancer (NSCLC) cells. Interaction with CRTAM promotes natural killer (NK) cell cytotoxicity and interferon-gamma (IFN-gamma) secretion by CD8+ cells in vitro as well as NK cell-mediated rejection of tumors expressing CADM3 in vivo. 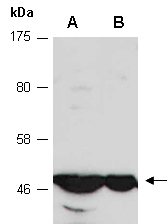 Rabbit polyclonal antibodies were produced by immunizing animals with a GST-fusion protein containing the C-terminal region of human CADM1. Antibodies were purified by affinity purification using immunogen.